Could be fun, or not. 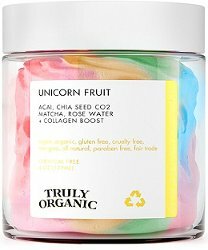 Unicorn Fruit Body Butter from Truly Organic: "An organic, multi-colored, whipped, body butter that smells so delicious you'll want to eat it!? Sign me up! It doesn't end there though.. The Unicorn Fruit Body Butter by Truly Organic is a product is packed with four of their favorite ingredients! (Matcha, Acaii, Chia, Rose) If you're looking for a fun, rich, hydrating moisturizer packed with loads of vitamins, nutrients, and antioxidants, you've found your match!" $20 for 119 ml at Ulta. Honestly kind of tempted. This looks fun! Yeah, it’s so silly but the chances of me buying it next time I’m at Ulta are pretty high . . . I hope it is possible to smell it first….would be lovely if it was a fruity rose. 12 year old me is squeeing right now! Cute, but is there ANY chance it’s not a cotton candy sugarbomb? I read the reviews at Ulta, they say light fruity scent with glitter(!!!). Also some say heavy and greasy, but overall 4.5 stars. I think this would make a perfect friend gift, I know I’d love to get one. OH, glitter, bad on me for not noticing. I’m wondering what it will look like after you scoop some of it out and the various colors get mixed together, or when you spread it around on your skin and it gets mixed up? It might not be a very attractive color.